I start this review with a hearty “congratulations” to the authors of this text. Ofelia García has always been at the cutting edge of theory generation in our field. Her work on developing translanguaging theory is arguably the most original to come along in a generation. Translanguaging is also one of the most misunderstood, incorrectly interpreted, and misapplied theories. For both these reasons, the publication of this book is not only a good idea; it is imperative in furthering the important work of understanding and applying translanguaging. This book makes a unique and important contribution to the field both for researchers and practitioners. Since its inception, questions around the concept and practices of translanguaging have abounded. What exactly is translanguaging? Is it a fancy word for code-switching? Is it a nice theory with few practical applications? Can teachers teach translanguaging? Do translanguaging principles only apply in bilingual program contexts? Is translanguaging one more thing to be scheduled into an already overcrowded school day? These are but a few of the varied questions that have been posed about this body of work, and this book does an excellent job of addressing many of these queries and concerns. 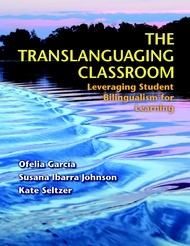 In reader friendly terms, the authors begin by providing a definition of a translanguaging classroom that few could disagree with: “A translanguaging classroom is any classroom in which students may deploy their full linguistic repertoires, and not just the particular language(s) that are officially used for instructional purposes in that space” (p. 1). They then move beyond theory into application in many different educational contexts, including dual language, ESL, English-medium, and elementary and secondary school contexts. Students in these situations are all developing bilingualism and biliteracy. Some of them have been doing so since birth, while others are new arrivals (some with strong backgrounds and formal education in a non-English language and some with no formal education in any language) and just beginning the journey toward bilingualism and biliteracy. These varied educational contexts with highly diverse student bodies are used in the book to illuminate the concepts of translanguaging. They include a 4th-grade Spanish–English dual language classroom in New Mexico; an 11th-grade social studies classroom in New York, where English is the official instructional language in the classroom even though the students speak a variety of languages; and a middle-school math and science classroom in Los Angeles, with a push-in ESL teacher for students from many different linguistic and educational backgrounds. Too often, the fields of bilingual/dual language/ESL education have been criticized as paying too much attention to instructional minutes and activities that are appropriated to the teaching of various languages and too little attention to the quality of instruction and pedagogy. The fields have been criticized further for believing that, in order to develop bilingualism/biliteracy, languages must be strictly separated for instruction in bilingual settings and should not be used for instruction in English-medium classrooms. This book challenges these dominant paradigms and clearly demonstrates how translanguaging practices enhance not only the learning of language but also the learning of content. Most bilingual/dual language and English-medium programs seek to take on topics and create practices that promote social justice; sadly few know how to do this. This book provides important information to help teachers use translanguaging pedagogy to teach for access, equity, and social justice. Further, teachers frequently decry the lack of support in all school programs for addressing and supporting the socioemotional needs of their students. This is particularly true for educators who are teaching emerging bilingual students, no matter what the school program is. That this book includes socioemotional development and support as part of its pedagogy is another strength. Central to the translanguaging pedagogy is having teachers learn to observe and use the translanguaging corriente, which the authors define as the flow of students’ bilingual practices. This understanding again illustrates that the pedagogy is more than content, activities, and techniques; it must include who the students are and the strengths they bring to the learning environment. Lest the book be criticized as too general, the translanguaging pedagogy is also comprehensive throughout the book, as demonstrated by and discussed in detail through its chapters on instruction, assessment, and standards. Finally, and as evidence of its comprehensive nature, the book also discusses the dispositions that teachers and schools need to successfully enact a translanguaging pedagogy. These dispositions include the stance design, and shifts. These topics alone make the book worth buying, discussing, and using in various professional development situations. This book will be useful for teacher education classes, professional learning communities in schools, and school districts implementing a variety of instructional programs for emerging bilingual students. It will appeal to teachers, professional developers, and researchers of second language learners in many contexts. The book will also be useful in graduate programs looking at theories of bilingualism and biliteracy development, and I will certainly require it in my own courses. I think this book will be read and re-read and will serve as the impetus for a great deal of other work over the next decade.